This is my second post on my trip to China (the first post can be found here). One of the striking things about Beijing is the amount of construction that is occurring. It is a very large city that is growing very quickly. As the nation becomes more prosperous, more and more people are looking for the better life that can be provided in cities like Beijing and Shanghai. The population of Beijing as of early 2011 is approximately 20 million, representing an increase of 44% (6 million people!!) in the last 10 years. That is pretty astounding growth. The traffic was very heavy throughout our time in Beijing. It was a national holiday which supposedly meant that the traffic was lighter. It was still very heavy. And the day after the holiday ended, our bus was locked in massive traffic delays on the highways we were using, even though it was a Saturday. The air quality left a lot to be desired as well. I heard all about the efforts to curb pollution during the 2008 Olympics. They may have temporarily improved it, but it was pretty bad while we were there. Our guide tried to explain it away as fog that was trapped due to the surrounding mountains. However, it was obvious (to me, at least) that we were experiencing more than fog. Anyway – back to the sights. We started the next day at the Summer Palace. This was where the emperors would come to escape the heat of the summer in Beijing. The place was spectacular. The haze in the air, however, limited visibility. We walked into the complex and saw a beautiful lake. Then, as we walked further in, suddenly the palace itself loomed on a hill in front of us. My jaw hit the floor when I saw it – it is that beautiful. The lake is surrounded by long corridors filled with magnificent paintings. At the far end is the Marble Boat (it was too far for our tour to go so I only got to see pictures of it). The place was teeming with Chinese people on their holiday. It is truly incredible to see what the emperors built for themselves and their families. After the Summer Palace, we got taken to the Hutongs (alleys) of Old Beijing. We went on a rickshaw ride through the neighborhood and then stopped at the house of a host family in the Hutongs for a delicious meal. The Hutongs have been disappearing to make way for modern Beijing. Fortunately, I think the government now realizes the cultural treasure that it has and it is not going to let it disappear completely. We met the woman that had cooked all the food for our group. She did not speak any English, but through the interpreter we were able to talk to her and tell her how wonderful her cooking was. This was definitely one of the better meals that we had in China. Later that day, we were taken to Tian An Men Square. This is the one of the largest squares in the world. Again, as a result of the national holiday, the place was all decked out in magnificent floral displays and other decorations. Most Americans probably only know of Tian An Men because of the famous image of a student standing in front of a line of Chinese tanks in 1989. The Square is kind of like the soul of Beijing. It stands literally across the street from the entrance to the Forbidden City (the Tian An Men gate – which gives the square its name). Once we left Tian An Men Square, we walked into the Forbidden City. As you walk up to the gate, there is a group of fountains with a water show that is just beautiful. We stood there watching the fountains for about 20 minutes. Then you walk into the outer ring of the Forbidden City. Just thinking about the fact that we were now walking into an area that was off limits to everyone until the 20th Century gives me chills. The Forbidden City was built between 1406 and 1420. The complex is humungous. The entire area is 178 acres, with 980 buildings which contain 9,999 rooms. We walked through the outer then inner parts for a couple of hours. There are a lot of interesting things within the complex. For example, the first telephone that was installed in China is located in the Forbidden City. One of the most beautiful parts of the Forbidden City is the Imperial Garden. 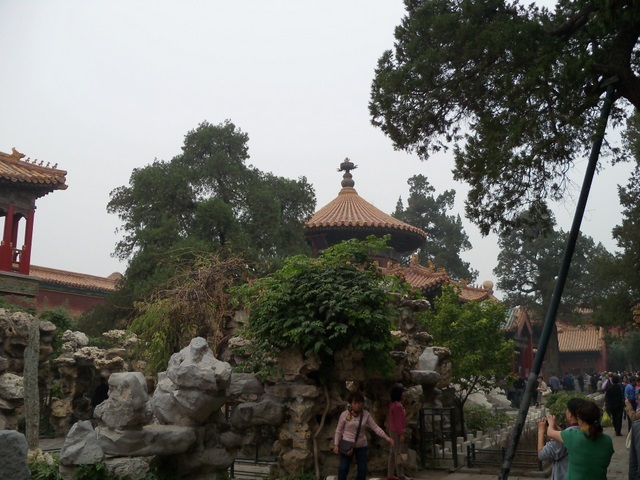 Traditional Chinese gardens are not like the gardens westerners are used to. But that does not mean that they are less beautiful. This garden was so peaceful and soothing (at least it was to me). Going back in my mind and reliving these experiences is a little difficult. The entire trip feels in a way like a dream. I still can’t believe that I was in China. Growing up, that seemed like one of the least-accessible places on Earth. Needless to say, I am extremely happy that I had the chance to visit this amazing country. In the next few posts, I will talk about our visits to some other cities in China – Suzhou, Hangzhou and Shanghai. To see some of my pictures from Beijing, click here. Great blog, Robert, with wonderful photos. Thanks for sharing.